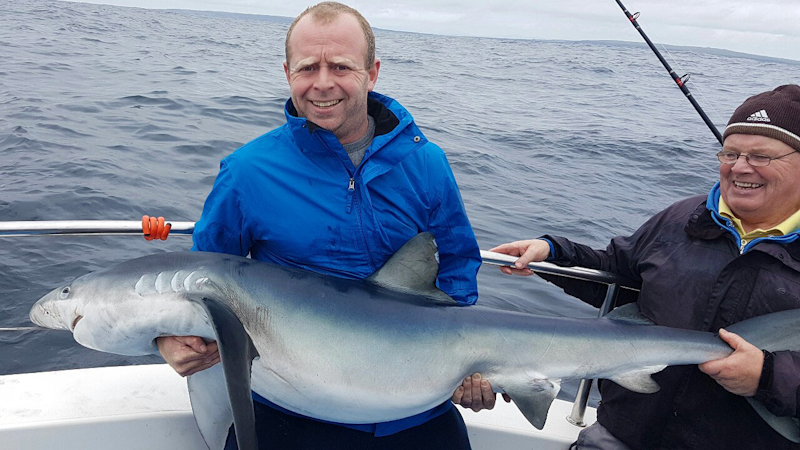 John Fleming, skipper of the Brazen Hussy II, reports that they are enjoying a great start to the shark season over the last couple of weeks, with plenty of blues landed and finally their first porbeagle. Some of the crew aboard the Brazen Hussy II with the boat's first porbeagle shark, and skipper John Fleming on the right. 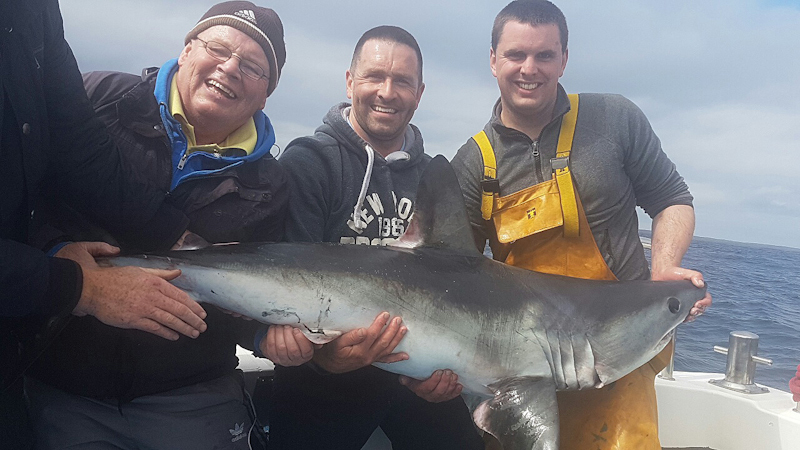 One of the many blue sharks landed by guests aboard the Brazen Hussy out of Galway Bay, July 2016. Fishery manager Osgur Grieve was in touch again with an update from the Erriff Fishery, covering fishing up to the 26th July. 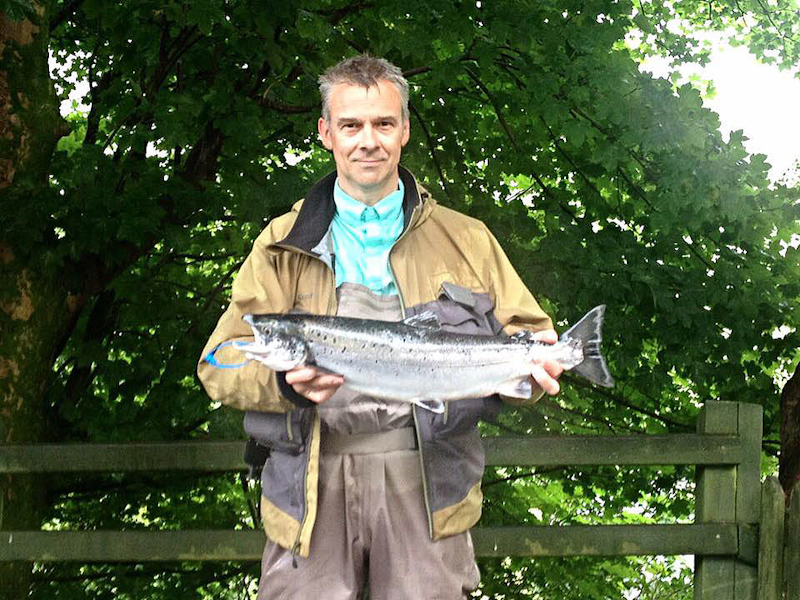 On the morning of the 21st regular visitor Andrew Beattie had a fresh 6lbs grilse from the Falls Pool on a Cascade. The same evening another regular angler Donal Chambers had a 4.25lbs grilse from the Middle Garden Pool using an Ally's shrimp fly. Ger Walsh was back to us again this year with his party and he caught his first salmon which weighed 8.5lbs from Beat 5, this fish came to a Red Flamethrower, he also spent a few hours on Derintinn lough and had a nice 1lb brown trout which he returned on a CDC Emerger. Gerard Garnier was up early on the 26th and had a nice 4.8lbs grilse from the Falls Pool on his Cascade, later that day Mary Couchman had a small grilse of 2.8lbs and lost another on a Cascade variant. Andrew Beattie with a nice 6lbs grilse from the Erriff, July 2016. Declan Gibbons reports that angling activity on Corrib was quiet enough over the last week, with many local anglers practising on Lough Mask for the upcoming World Cup. Anglers that have been out were rewarded for their efforts. On Saturday last Dorrie Gibbons from Cong hosted a fishing competition - Cast A Line For Autism - in aid of a very worthy beneficiary - a sensory garden at Cong National School. 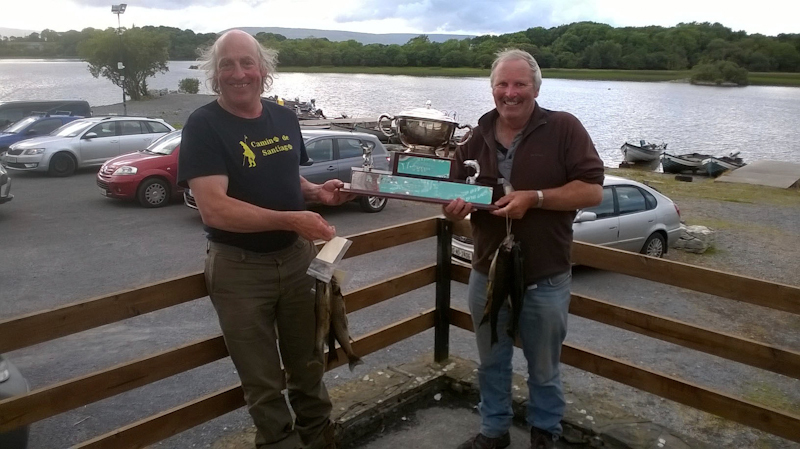 38 anglers participated in the competition where participants could fish either Lough Mask or Lough Corrib. Fly fishing and dapping were the methods permitted and saw 35 trout weighed in - 21 fish off Lough Corrib and 14 off Lough Mask. First Place went to Cornamona man Peter Walsh with 3 fish for 5.11lbs on Corrib. In second place was Darren Maguire, Fermanagh with 4 fish for 4.73lbs off Mask, and in third place was Mick Dunne, Tourmakeady with 4 fish for 4.68lbs on Mask. Fourth place went to Vincent Hughes from the Neale with 2 fish for 4.66lbs on Corrib, and Vincent also had the heaviest fish at 2.74lbs. Best Lady angler was Dorrie Gibbons with 4 fish for 4.37lbs on Mask. Peter Walsh, winner of the Cast A Line for Autism competition, is presented with his prize by Dorrie Gibbons, competition organiser, an Liam Roche from Salmo Salar, Main Sponsor. 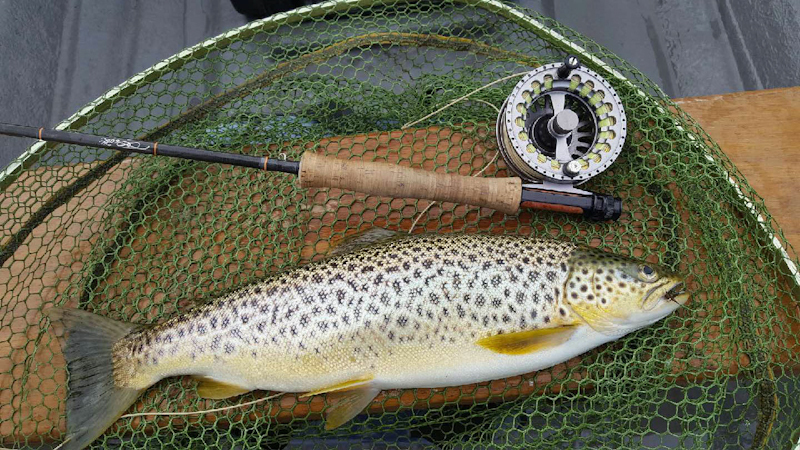 Basil Shiels of Ardnasillagh Lodge, Oughterard reports on some excellent fishing on Corrib to olive and mayfly patterns, both wet and dry. Basil Guided Campbell Baird from Carrickfergus and a French TV Crew for 4 days landing 19 trout with the best fish over 4lbs. 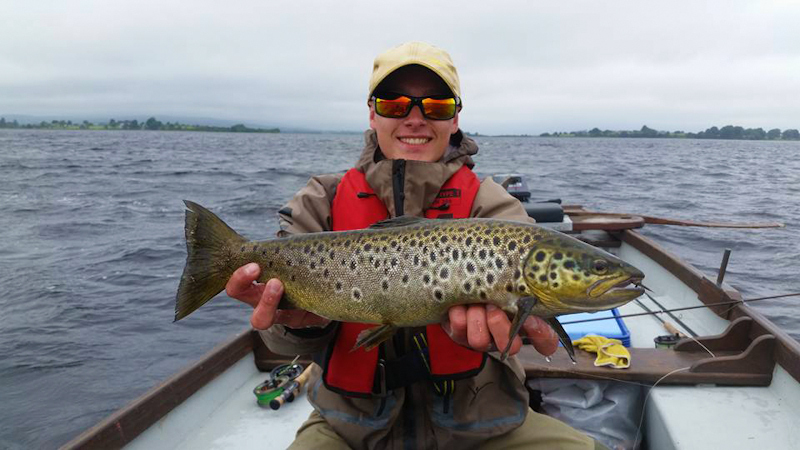 Luc Macret with a beautifully marked 55cm trout from Lough Corrib, July 2016. Colin Wright from Belfast had excellent fishing for 5 days in Oughterard landing 13 fish best fish being 4.8Lbs and three more fish over three pounds. Shanon angler Glen O'Connell had 2 fish for his visit and John Fitzgerald had 3 with the best fish being 2.25lbs. Victor McDevitt from Comber, Co Down had 3 fish for one day on dries. Staying in the Oughterard area Kevin Molloy (Baurisheen Bay Boat Hire, tel. 087 9604170) says there was good fishing to be had on a mixture of dapping grasshopper, wet fly fishing and trolling with visitors from France and the USA very happy catching trout on Lough Corrib. Michael Canny fished with Kevin and had excellent fishing for 2 days dapping and trolling with one fish of 7lbs caught trolling and 2 dapping - all released apart from one fish. In the Cornamona area Tom Doc Sullivan (tel. 087-6113933) reports of Midlands anglers John O'Neill and Leonard Geoghegan enjoying a day's fishing last Thursday on may fly patterns and landing 4 trout with the best fish being 2.25lbs. In the Greenfields area Robert and Ciaran Reilly, Loughrea fished on Thursday last and had 9 fish on wet and dry fly with the fish ranging in size from 1.25 - 2lbs. Also on the same day in the evening Frank and Oisin Reilly, Glencorrib had 3 fish for their efforts on dry sedges and Oisin had the best fish of 4.5lbs. 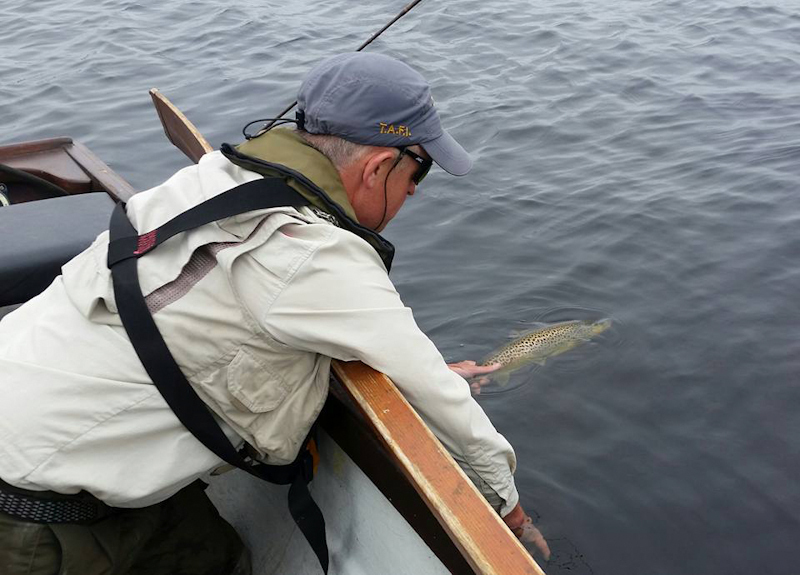 Larry McCarthy of Corrib View Lodge Glencorrib (www.corribangling.com) reported quite an improvement in fishing over the last week, with some good action on mayfly in the Greenfields area. Malcom Patrick from the UK enjoyed 2 days with dry may fly catching 6 trout to 2lbs. Larry himself enjoyed a half day with Paddy Kinneavy in the Cornamona area, boating 4 nice trout to dry fly. Two Dublin anglers - Aaron and Stephen - had great fishing at Malachy's and Inchagoill, guided by Larry on Saturday and Sunday catching 7 fish between 1.5 - 2lbs and lots of sport with many more small trout. All fish were sportingly returned. A perfect Corrib trout from July 2016. Photo: Larry McCarthy. Ronan Cusack reports that there was plenty of activity on Lough Mask over the weekend as the excitement builds for the upcoming World Cup, which starts tomorrow the 28th July. Ballinrobe & District Anglers held their annual club competition on Sunday last which was supported by 46 anglers. Conditions on the day were excellent, with south westerly winds and plenty of cloud cover. As usual for this time of year, boats were dotted all across the middle as the black water produced most of the goods. 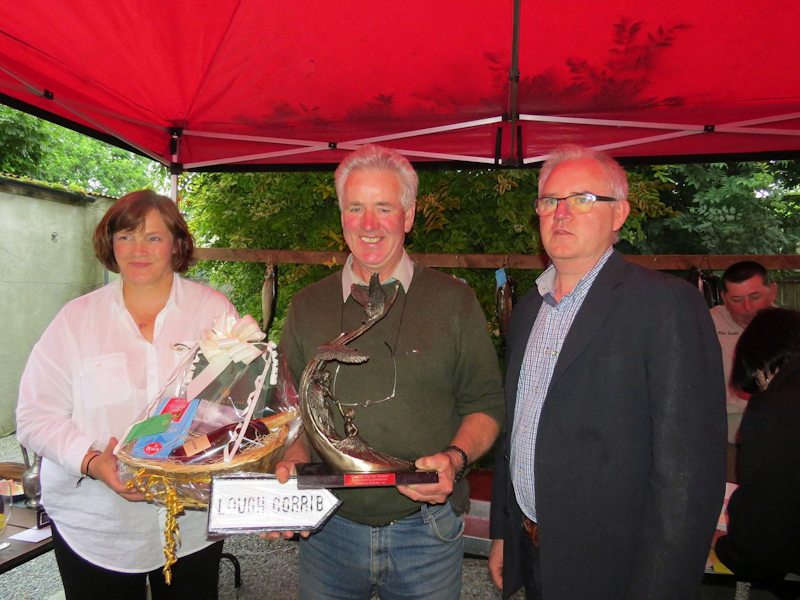 This year's winner was well-known angler Peter Byrne from Castlebar, with 4 trout for 4.714lbs. Second position went to Terry McGovern from Fermanagh, with 4 fish for 4.664lbs, and in third place was Michael Twohig from Kanturk, with 3 fish for 3.752lbs. Heaviest fish prize went to Kevin Egan from Ballinrobe, with a trout of 2.592lbs. Peter Byrne (R) winner of the Ballinrobe & District Anglers competition celebrates with his boat partner and this year's Gold Medal winner in the World Masters Fly fishing Championships, Jackie Coyne. Ennis anglers also held a 2 day competition over the weekend which was fished to a 14 inch limit. 30 anglers took part with a total of 14 fish weighed in. Niall O'Neill took first prize with 2 fish for 4.20lbs. In second place was Terry McGovern Jnr, with 2 fish for 4.00lbs. John Harte took third prize with 2 fish for 3.11lbs. Heaviest fish went to Thomas O'Loughlin with a fish of 2.60lbs. Anglers fishing on the lake have noticed and reported an increase in numbers of small fish across the deep at the moment and are concerned that these fish are handled in a proper manner and returned to the water safely. Inland Fisheries Ireland officers are very much aware of this and are out in force at the moment around the lake carrying out routine checks on both size and bag limits. Anglers are asked to respect the minimum statutory size and bag limits and return any undersize fish to the water as quickly and carefully as possible.